When you think of the Caribbean, white-sand beaches or clear blue water may come to mind. While food may not be at the top of the list, after eating at Adobos, it should be. While reading the menu at Adobos, you’ll try to connect the names of dishes with the tantalizing aromas filling the restaurant. The dinner menu is broken into three primary sections: appetizers, mofongos and specialties. What is a mofongo? 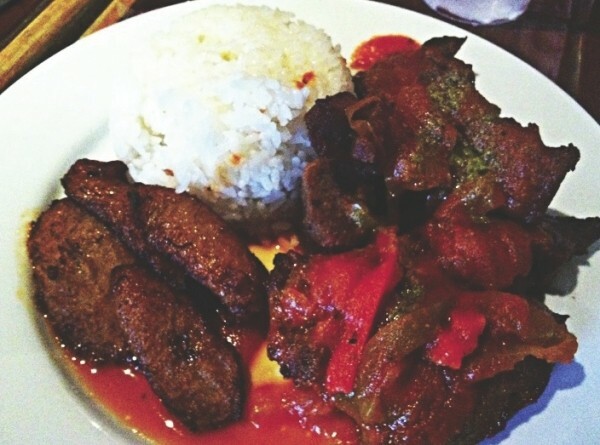 It’s the specialty of the house: a fried green-plantain-based dish. The plantain is mashed with olive oil, salt, chicharrones (pork cracklins) and garlic. It’s crispy, savory and delicious. Now, that sounds good enough on it’s own, but you’ll also need to pick what you want on top: chicharones de pollo, grilled chicken breast, carne frita, ropa vieja, filete de mero Ã la criolla or shrimp Creole. Choose wisely, as you will only regret what you couldn’t eat. I went with the carne frita mofongo: marinated, slow-roasted pork cut into bite-size pieces and fried until crispy with a touch of criolla sauce (a Cuban garlic sauce) and cilantro mojo. The pork was incredibly moist and tender, with a hint of both sweet and spicy. The atmosphere at Adobos is definitely relaxed. You don’t get that “rushed” feeling of everyone needing to be somewhere else quickly. If you are coming to Adobos, you should enjoy the simple pleasures of eating, not be looking for a way to fill your tummy while running out to nine more commitments. It’s time to taste the unique flavors of the Caribbean—and Adobos is the place to start.